Certificate of Entitlement (COE) premiums fell in all categories in September first round of bidding exercise (Sep 5). 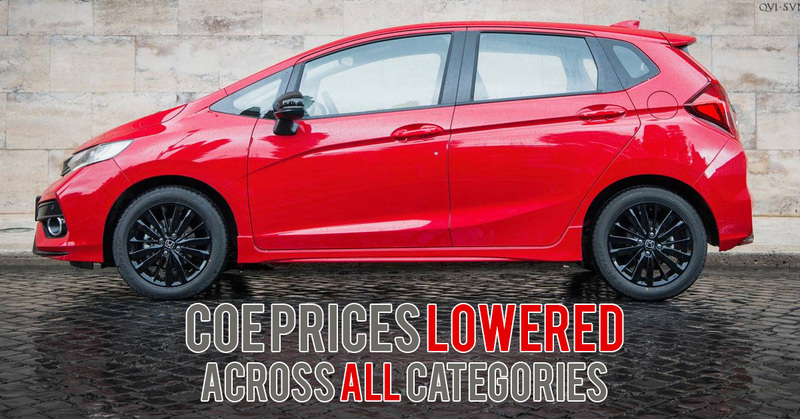 COE for category A (cars up to 1,600cc & 130bhp) ended at $30,209, down about 5.6% from $31,997. COE for category B (cars above 1,600cc or 130bhp) fell about 1.3% from $32,429 to $32,001. COE for category C (goods vehicle & buses) dropped by 9.7% from $29,902 to $27,001. COE for open category went down by 1.58% from $32,311 to $31,801. One of the reasons that caused COE premiums to drop across all categories was the ongoing Hungry Ghost Festival. This particular period is traditionally a low buying period especially for the Chinese. People are averse to getting married, moving house as well as buying cars. The car buying interest would once again be re-ignite with the Hungry Ghost Festival ending soon and decrease in selling price of new cars due to fall in COE premiums. This might cause a rebound in COE premiums next round. So if you are looking to buy a new car, take advantage of the promotion now. The attractive packages Cars & Stars are offering would be enticing for both first-time buyer as well as for those people looking to trade-in their existing cars. Check out Cars & Stars latest promotion on our Facebook page today!